Simi Valley Mobile Screen Repair Service Professionals | Screen Door and Window Screen Repair and Replacement Simi Valley, Thousand Oaks and Surrounding Areas. Are your sliding screen doors not sliding the way they should? Are they constantly alligator off the tracks and channels? We can help. Econo Screens offers free quote on the spot in writing or over the phone. Screen door Simi Valley repaired and replaced at you place is our specialty. We measure and make custom screen door while you wait. Custom screens are needed in most cases and that’s why mobile services like ours exist. Slider door openings are not easy to measure because houses settle with time and this causes gaps and tight spots in the tracking area. 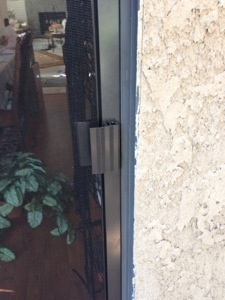 As the top channel and bottom rail warp up and down the screen door does too, causing it to get stuck or fall off. Pre built universal sized sliding screen doors never fit right and this is the main reason why so many people are always fighting their screen doors. Quality screen door like the ones we install in Simi Valley are custom made for this reason, so they slide smooth and do not fall out.